With growing consensus about the dangers posed by climate change and the need to curb our emissions of greenhouse gases, an increasingly vocal assortment of environmental, scientific, government and industry evangelists are preaching the gospel of nuclear salvation. Almost 20 years on from the Chernobyl disaster, the nuclear industry now appears to be recovering from the fallout of negative public opinion and is increasingly being seen as a ‘green’ solution to the world’s intensifying energy demands. 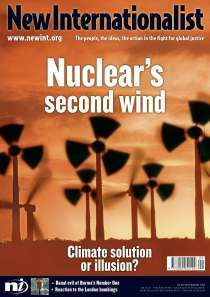 This issue of the *NI* seeks to unpack the arguments supporting a renewed interest in nuclear power and some of the enduring impacts of our quest to harness the power of the atom. A boy carrying firewood home, captured by Kenyan photographer Carol Kaminju. No nukes is good nukes; find out how.